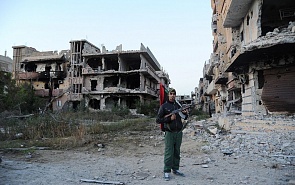 Is Libya Capable of Exercising Sovereignty Over Itself? Seven years following a popular uprising against dictatorial rule, Libya remains a conundrum that begs an uncomfortable question: is the post-Westphalian, sovereign nation-state model, whose sine qua non is a monopoly on the use of coercive force, attainable by - or even well-suited to - the geopolitically daunting, vast pastiche of coastal urban centers, tribal groupings and desert oases designated a political unity by the United Nations in 1949? If the Westphalian model is not workable, then what are the options, both for Libyans and others affected by its political turmoil, competing security organs and resultant criminality, lack of control of its borders and exploitation of Libya’s ungoverned space to prepare and launch terrorist acts against neighbors and beyond? Can regional parties or the broader international community manage and contain this vast, strategically positioned territory whose hydrocarbon wealth remains critical to the economic wellbeing of its people and others, whose location presents both threat and opportunity, depending on one’s vantage point? And if so, where lies a successful model for such “containment” and external management of Libya’s hydrocarbon production absent political stability within? Is the best we can hope for an approach that disregards the aspirations of the Libyan people while external actors assert spheres of influence across a loosely associated federation, coordinating to deconflict their actions while pursuing disparate interests (energy security, migration, counter terrorism, disruptive religious extremism)? Toward what end? And for how long? The reality is that no external state can afford an open-ended investment of “blood and treasure” for the sake of regional or energy security. Historically, no entity, neither the Ottoman Empire nor Mussolini’s fascist regime, could sustain the resources and political will needed to occupy Libya from within or direct it from without. From a practical and realistic standpoint, only political reconciliation and the painstaking (and admittedly painful) process of finally creating a state from statelessness will address the persistent needs of Libya’s people and its neighbors. But perhaps some terms and definitions related to the nature of that statehood, and the question of sovereignty, should be revisited and revised in light of current realities. To begin with, I would suggest that the definition of “coercive force” must be redefined to mean international solidarity and support for the UN political process, given the ongoing fragmentation of Libya’s national security forces and the persistent involvement of independent heavily armed militias. This coordinated and jointly negotiated support admittedly cuts into the singular authority of the UN Secretary General’s Special Representative but also buttresses his efforts to contain and shape the activities of regional actors while supporting a political process that leads to ever greater sovereignty for the Libyan people, with greater control over their own lives and resources, while acknowledging the interest of others affected by Libya’s lack of stability/effective governance. And any successful political process must include or account for the equitable distribution of LIbya’s hydrocarbon wealth as well, without which there will be no security. Absent a “national idea” or broadly shared Libyan identity, which will emerge as part of the political process, it is Libya’s hydrocarbons - linking her southern deserts to her Mediterranean ports - that provide a pretext for national unity, if properly and transparently exploited and distributed. And for the oil to support national unity, the National Oil Company and the Central Bank of Libya must remain unitary and inviolate, with the support of the international community. Successful states in the modern era have exercised sovereignty over their citizens and territory through the establishment of national armies, based on universal conscription, and broadly acceptable bureaucratic systems for the equitable - or at least rational or politically acceptable - distribution of national wealth, however measured, via commercial advantage, taxation, or a welfare-state model. Historically, the state’s implicit monopoly over the use of legitimate coercive force has compelled adherence to agreed or imposed frameworks for civic interactions, social discourse, trade and commerce. Following World War II, the gold standard for emerging democracies has been the state’s adherence to the rule of law.and support for the civil rights of its individual members. None of this pertains in Libya, nor has it ever. When I arrived in Tripoli in June 2013, much of the wind had been taken out of the revolutionary sails of February 2011, and the horrific attack on our diplomatic facility in Benghazi had injected a degree of sobriety into the euphoria that accompanied the overthrow of the dictator. The physics of coercive force had been undone in the Arab Republics of Tunis, Egypt, Yemen and Libya by the introduction of the mobile phone and social media, wherein the accelerant in the equation “F=ma” became the electron in the hands of the masses, leading to an overwhelming force (which thus far has proven more adept at tearing down than rebuilding). Nonetheless the approach to “restoring” the Libyan state remained textbook: we would seek to strengthen the fledgling government of Prime Minister Ali Zeidan (the third since the revolution and the highly acclaimed elections of July 2012) by developing a General Purpose Force that could overpower competing militias and establish rule of law. My instructions prior to going out were essentially: “Don’t allow Libya to fall into the Syria column; after all, how hard can this be? 1.2 million barrels of oil a day for a population the size of the state of Massachusetts?! ?” My unwelcome response was that giving a two-year old orphan in a bad neighborhood a trust fund without a wealth manager would not end well for the child. And indeed when Zeidan’s government failed to deliver on economic benefits, and was perceived to be hugely corrupt, not only did it militate against the creation of any sort of national army but also brought him down following the March 2014 attempt by Ibrahim Jadhran and his renegade petroleum guards to pilfer a shipload of national oil. The US government was instrumental in capturing and returning the oil to the government in Tripoli but the episode revealed deep political fissures within Libya - what I have elsewhere referred to as “the unfinished revolution” - and the involvement of external parties. At that time the US proposed to the National Oil Company and then-minister of oil that they actively inform and educate the Libyan people regarding the exploration, exploitation, production and sale of Libyan oil wealth, which ironically remains the singular element with the potential to unify the country pending the necessary political evolution. Our proposal was rejected. To his credit, current NOC Chair and longtime technocrat Engineer Mustafa Sanalla has acknowledged the need to develop a transparent approach to the production and equitable distribution of Libya’s oil wealth and has worked diligently to sustain production despite all hardships resulting from the ongoing political fragmentation and security disruptions. Similar transparency is needed from the Central Bank. Most importantly, these two critically important bodies, the heart and lungs of any successful Libyan renewal, must remain unitary and the neutral organs of an authoritative Libyan government recognized nationally and internationally. Given its geography and energy resources, Libya matters too much for others to ignore it; space abhors a vacuum. In the absence of a government that is both recognized internationally and fully empowered to act, external powers naturally will seek to establish spheres of influence to address their concerns, whether they be a reliance on Libyan energy, unchecked migration, transnational terrorism/security concerns or an implacable aversion to the emergence of a “political Islam” believed to be inexorably committed to the downfall of neighboring/regional regimes and the establishment of Sharia rule. In Libya, the US has sought to cooperate within the bounds of international law, and would much prefer to engage with an authoritative government than to contrive ad hoc opportunistic arrangements that suit our purposes. That said, states will do what they believe must be done to protect their citizens. The reality is that external players will act opportunistically when it suits their purposes but are not prepared to spend the blood and treasure required to impose what in any case is would be ephemeral order on the country in the absence of Libya’s own governing bodies. But what will these look like? And will there be room for ongoing cooperation to address shared concerns? Even Ghaddafi was unable to establish secure borders throughout Libya’s vastness and asserted control (or attempted to buy loyalty) through what can only be described as a system of bribes and turning a blind eye to smuggling activities. This “flexibility” is unacceptable in the modern security environment and a Libyan government must learn to negotiate in good faith with international partners who share security objectives. The challenge faced by a succession of UN Special Mission in Libya SRSG’s, diplomatic mediators, ambassadors, Special Envoys and others has been to decipher what Libyans truly want in the way of a government. On the heels of the revolution, many have engaged in sincere, painstaking deliberation with a wide range of interlocutors from across Libya’s political, intellectual and civil society spectrum aimed at distilling the essential elements of successful Libyan political unity. This task is not simple in a society whose political illiteracy was deliberately nurtured, not only by Ghaddafi but by the regime that preceded him, enabled by the enervating largesse of the welfare state. Out of this dialog - which began in late 2013 as a confidential mediation by Tarek Mitri between the two principal factions within the now-defunct General National Congress and developed into sustained talks with over 40 representatives from the GNC - emerged three precepts: Libyans wanted a government that was “not heavily centralized” and was “somewhat presidential in form.” They also agreed that shari’a was “an acceptable basis for a constitution.” Later, when the UK and USA, frustrated with the slow pace of Mitri’s political dialog, named envoys to engage directly with assessed Libyan powerbrokers (a somewhat questionable premise in hindsight), Libyans appeared to agree on ten fairly anodyne principles regarding the state and its authorities. Bernardino Leon took the process further, constructing and leading multiple dialogs between various groups that resulted in the historic 2015 agreement that produced the Government of National Accord. His successor, Martin Kobler, pressed Libyan progress on its constitutional drafting and Ghassan Salame has continued to refine Libyan thinking on the structure, authorities and allocations of power within a government, an essential precursor to new elections (which in the past have served only to create fissures, in the absence of clear institutional authorities). Some have criticized this lengthy, fragmented and inefficient political process, frustrated by the exploitation of Libya’s ungoverned spaces by criminals and terrorist elements and tempted by opportunistic alliances that appear to facilitate broader security or humanitarian objectives. While understandable, this approach will not lead to sustainable solutions. Meanwhile, those of us to who have witnessed first hand the exchanges between former enemies or those whose agendas remain unformed can attest to the value of these talks and the political maturation of those engaged. This is state-building at its most fundamental level. Meanwhile, it should be clear by now to observers that those who have sought to dominate by traditional definitions of force have not learned the lessons of modern physics and social media. They cannot succeed in creating a monopoly on coercive force except through legitimacy, and will require the support provided them by the aegis and authority of an empowered government, and the international partners supporting that government. This is why it remains essential that the international community, and particularly the UNSC P5 members plus Italy and other concerned regional parties remain closely synchronized and supportive of the SRSG’s efforts, which is turn should reflect the priorities and objectives of the international community as well as those of the Libyan people. The term “federalism” is anathema in Libya, but there - just as in the United States and elsewhere globally - it is clear that empowered local governance is taking on greater importance, for a variety of reasons. Libyans should seek to adapt terms to their needs, not be constrained by outdated definitions. As we have seen, things function relatively well at the municipal levels in many areas of Libya and any government should seek to empower them with appropriate funding in a manner that is transparent, equitable and governed by uniform rules and regulations that minimize cronyism and corruption. Urban Libyans and rural Libyans may have different priorities, but it shouldn’t make them less entitled to support. Experienced technocrats will be needed; all Libyans should be welcomed and rehabilitated if not guilty of heinous crimes. A singular failing on the part of the international community was to remain silent in the face of the April 2013 intimidation of Libya’s parliament (GNC) by armed militias and the imposition of the so-called Political Isolation Act, which effectively removed many technocrats having the most expertise in the areas most needed to sustain LIbya’s essential ties to the international community. The security dialog has lagged behind others, in part because there has been no clarity regarding the distribution of power and national wealth. Inter alia, the 2011 revolution provided an opportunity to acquire lucrative assets that militias were loathe to relinquish. Meanwhile, all have continued to be funded by Libyan national resources through the Central Bank. Sadly, the proliferation of violence will require some sort of a formal national reconciliation process on the scale of that undertaken in South Africa. There may be local solutions for integrating militias under rules similar to those applied to US or Swiss National Guards or other models. Our own police forces have acknowledged the benefits of recruiting from within the communities they serve. On a national level, there may be acceptable formulas for creative conscription for rotating assignments related to Libya’s borders or other international obligations (to include UN peacekeeping, for example). Again, one can reasonably question what the nature and makeup of Libya’s national security forces should be, based on the assessed threat environment. And where Libyans can benefit from cooperation with external elements, based on mutual interests and under agreed rules of engagement, they might reconsider their aversion to foreign engagement on Libyan soil, particularly as it applies to mine clearing or other mutually beneficial training activities. As an American, I believe that the inalienable human rights of political, religious and personal association are best protected under the aegis of a strong government accountable to its people and the rule of law. In the end, Libyans must decide whether they will make the necessary compromises that will enable them to form that government and exercise sovereignty over their state. Otherwise, they will be forced to accept the inevitability of remaining the playing field of external regional powers in a state of endless uncertainty, which I’m sure they would agree is completely unacceptable.